At trial, the defense was allowed only to introduce a limited amount of evidence regarding the situation in Baghdad in 2007. 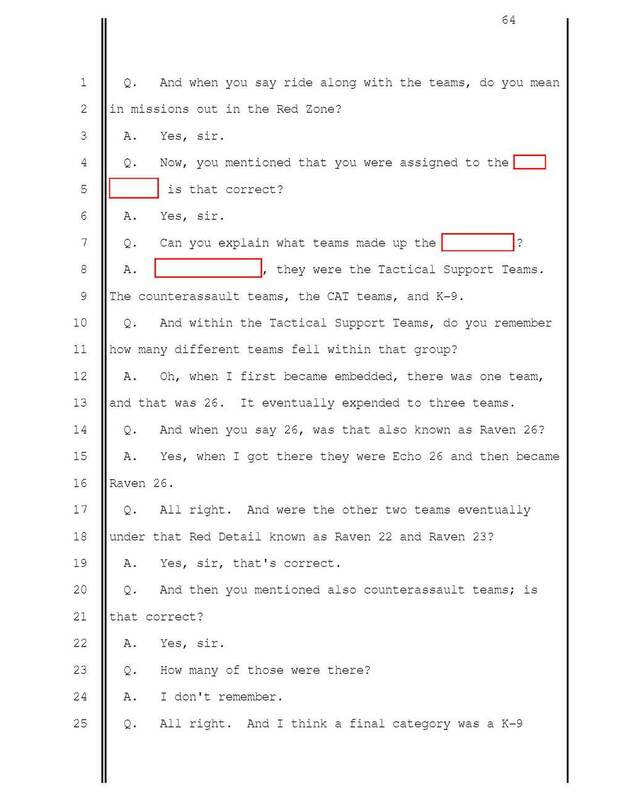 On this page you will find not only details about incidents that impacted Raven 23 prior to September 16, 2007, but additional materials that will give you some insight into what our military and contractors were dealing with. WARNING: some video footage is extremely graphic. The origin of some of the footage we have gathered is unknown. If anyone is aware of any copyright issues, please let us know immediately and we will address it. We ask that the Lord bless the families of all the people impacted in these videos. They are horrifying, yet necessary to view. You must understand why men come home forever changed. No amount of money earned makes this any less life-changing. Uploaded by Support Raven 23 on 2015-01-15. 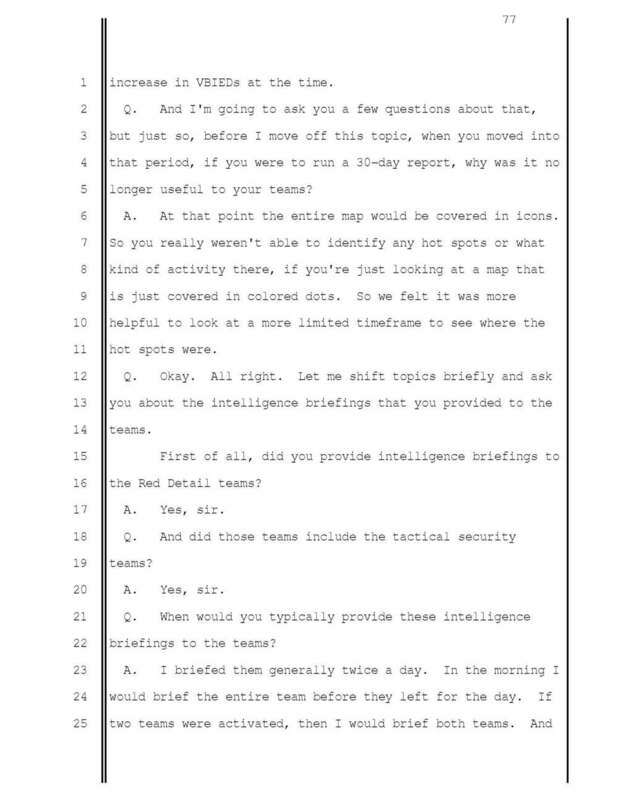 At trial, even the Blackwater intelligence analyst was limited as to the extent of her testimony. 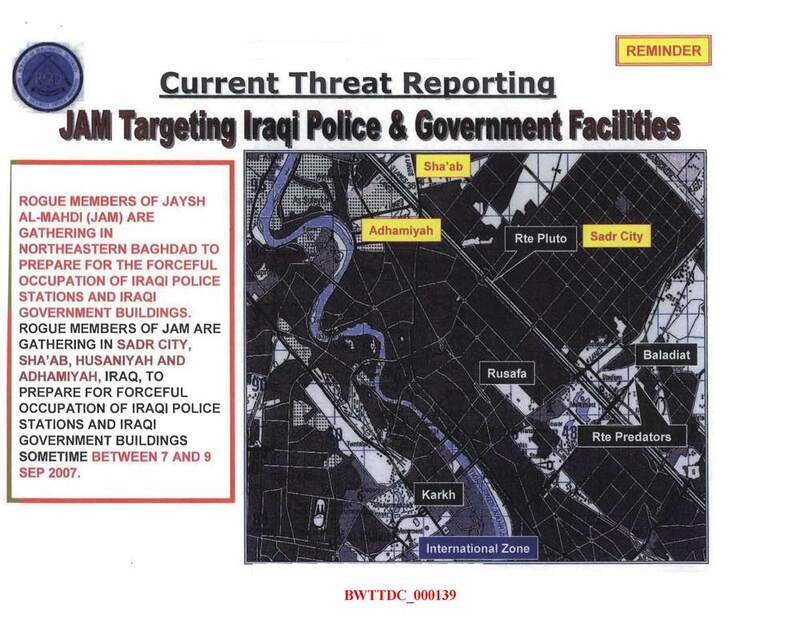 Her account of the threat situation in Baghdad is riveting, however. 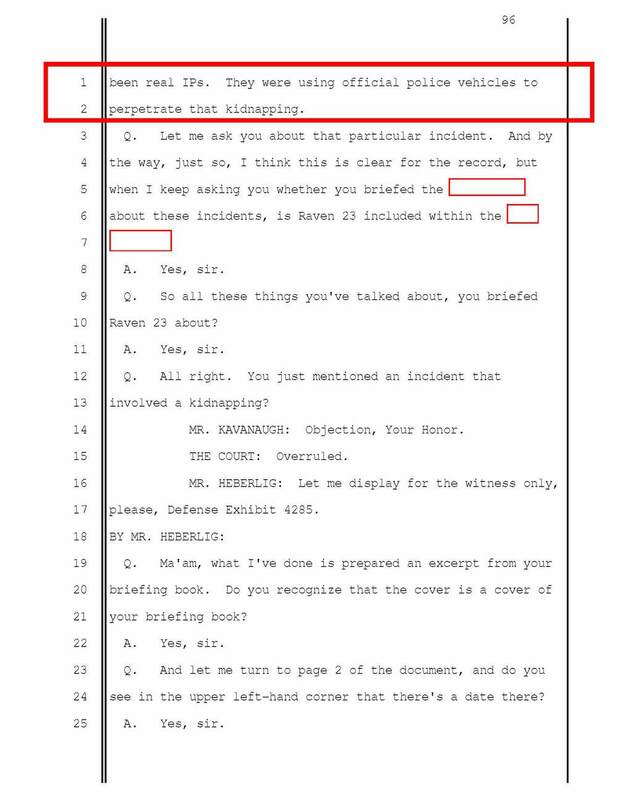 Most of her testimony is included below. She currently lives the life of a quiet professional, so her name will not be broadcast here. 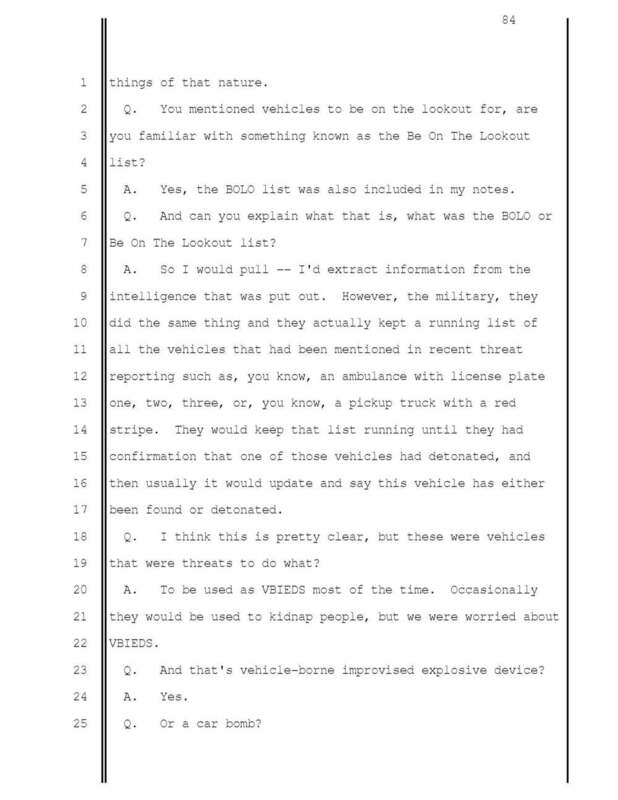 That is not what is important - what IS important is that every single car in Baghdad at one time or another was on the BOLO list. Some scoffed, and said that made the BOLO list irrelevant. Others realized that you could never, ever let your guard down. Ever. 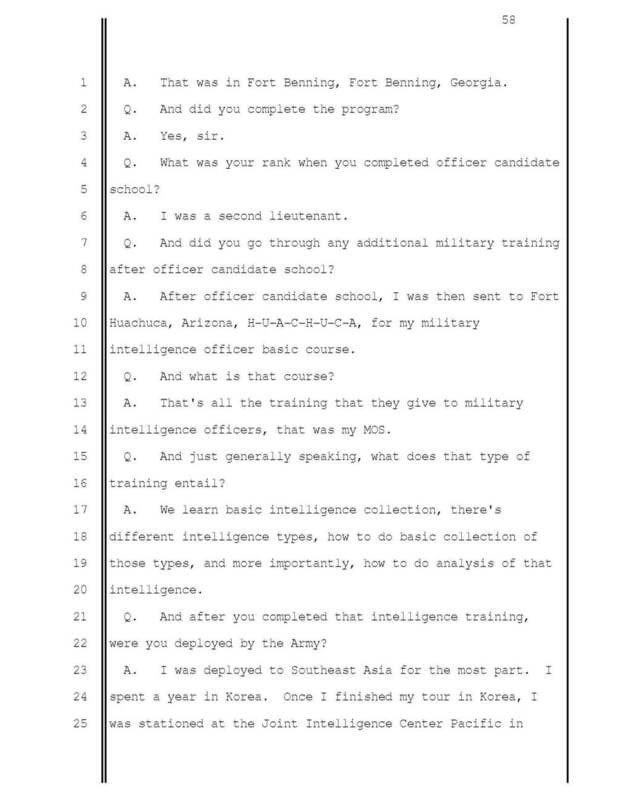 The first part of her testimony gives you some background on the kind of person it takes to make a good intelligence analyst. 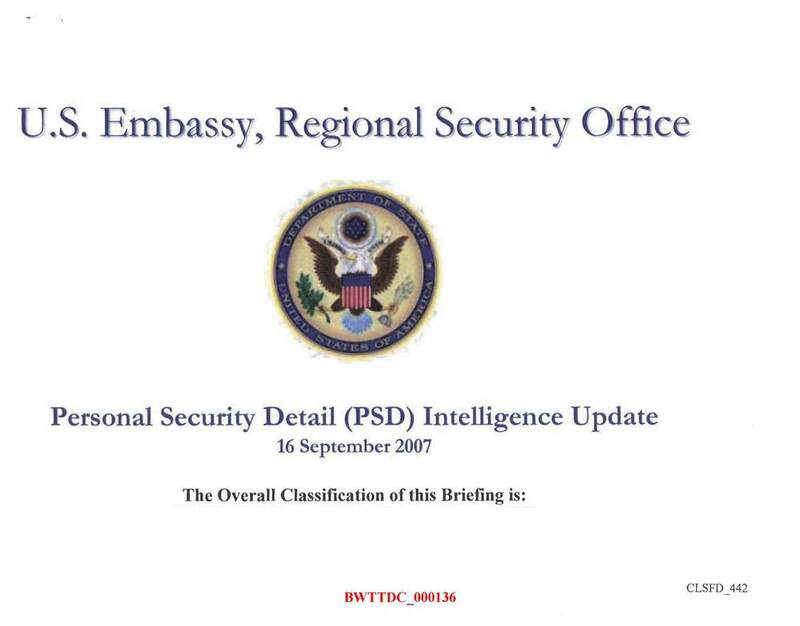 This is the briefing intel from September 16, 2007. Pay special attention to the VBIED Ambulance warning. Al-Yarmouk Hospital was just a few hundred meters away from Nisur Square. Now let's jump in here and interrupt her for just a moment. CRITICAL to the prosecutor's case against these defendants is their need to convince the world that the convoy took no incoming. 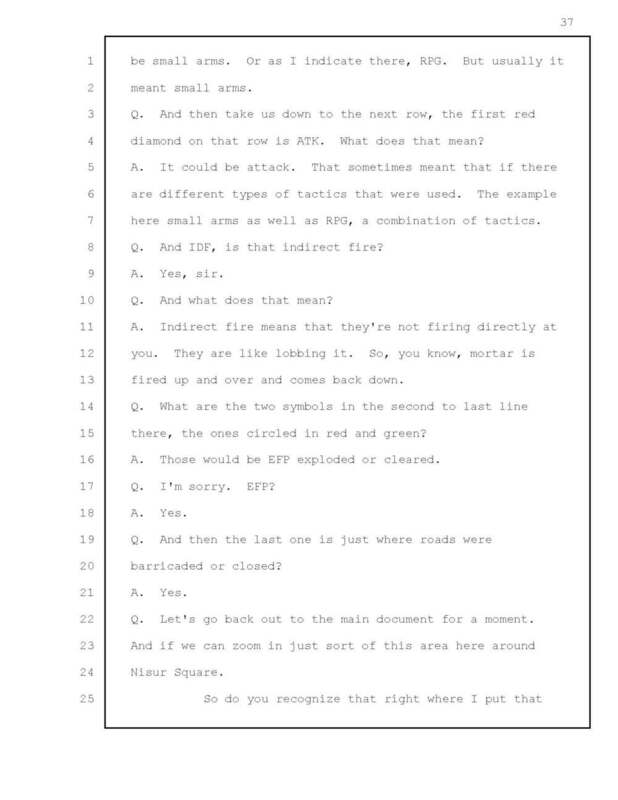 They were unprovoked, and decided - for no reason at all - to begin firing on "unarmed, innocent civilians." 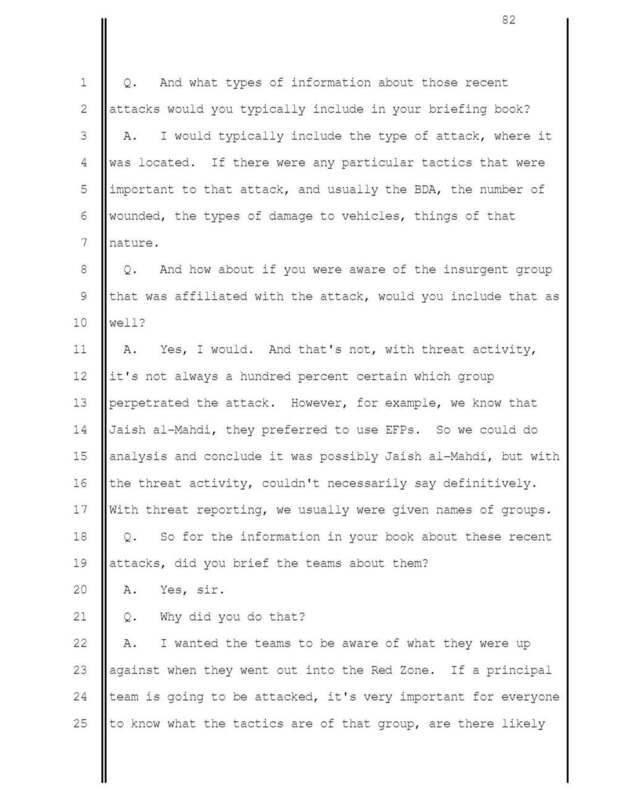 If there was any hint at all that the convoy was defending themselves, then the actions they took were not criminal. Let's stop a moment and look at the elements of self-defense. 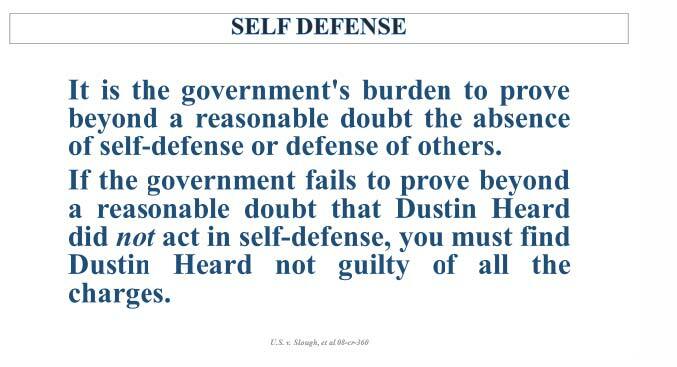 Again, while the narrative lists Dustin Heard only, the SAME PRINCIPLES apply to each and every one of them. Pursuant to the legal definition of self defense, the government had to prove that these men had NO RIGHT to self-defense. To that end, the white Kia became critical. 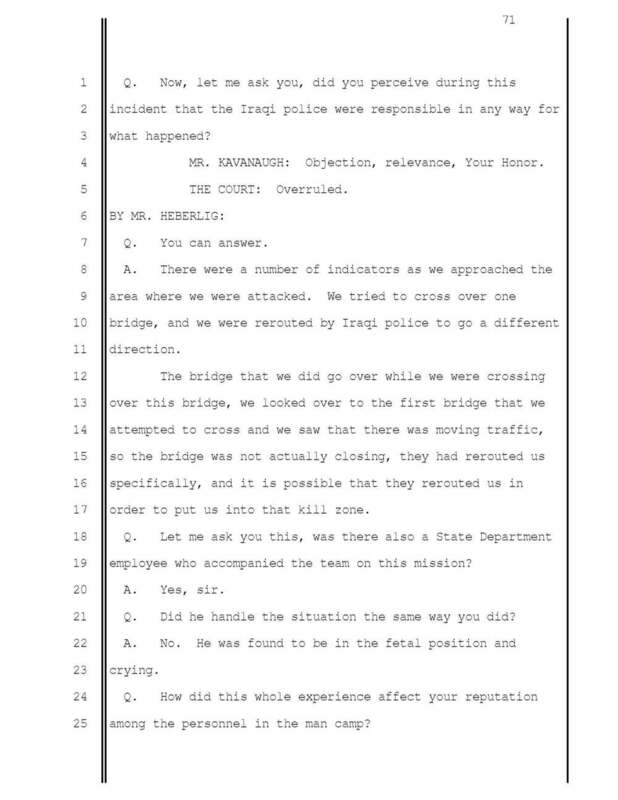 Early witness statements was that an Iraqi policeman had waved through the white Kia, even though other vehicles had stopped. That part of the story faded away as the Iraqi investigation progressed. The Iraqis - especially the Iraqi Police - could not claim "massacre" if they had, in any way, contributed to the situation that developed. 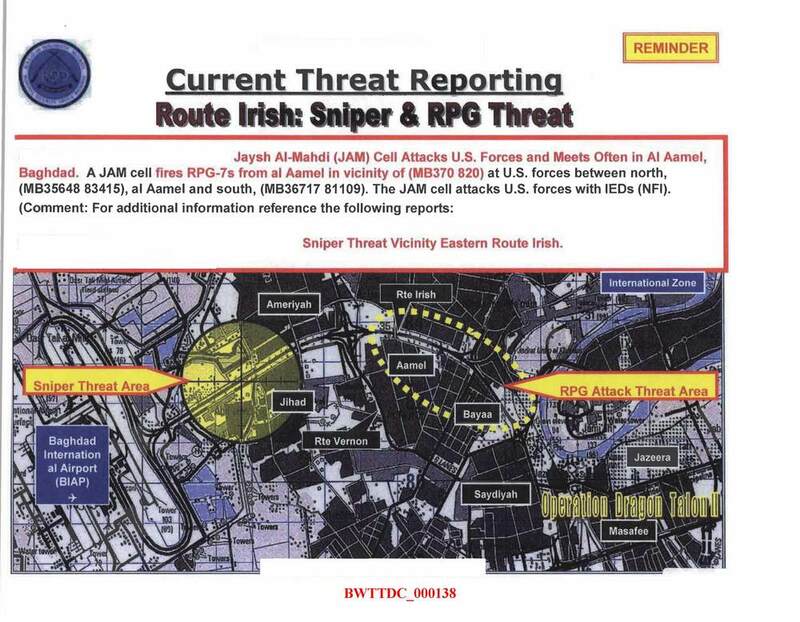 In any event, given the intelligence briefings that these men received every day, there can be NO DOUBT that a car coming toward them, past a line of cars that had stopped, could have - should have - been considered a legitimate threat. VBIEDs were on the rise. There was even such a thing as a TBIED (turban-borne IED). Suicide bombers were riding motorcycles, bicycles. Anything, anywhere, anytime. 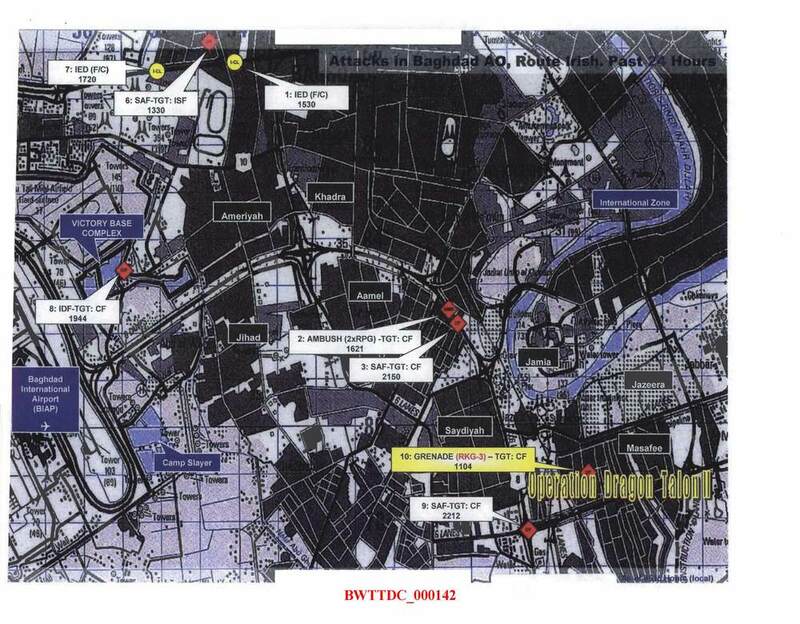 It seems everyone knew what was going on in Baghdad except for the prosecutors. 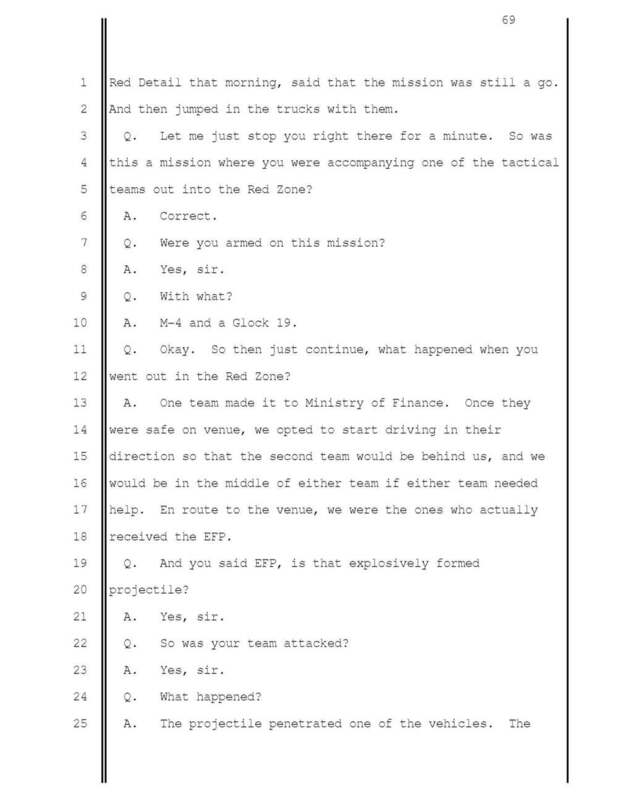 Back to her testimony....about how people dressed as Iraqi policemen aren't always...and should never simply be "trusted." Refer back to the Incident page here, to see the photo taken by a contractor - of uniforms for sale on the streets of Baghdad. 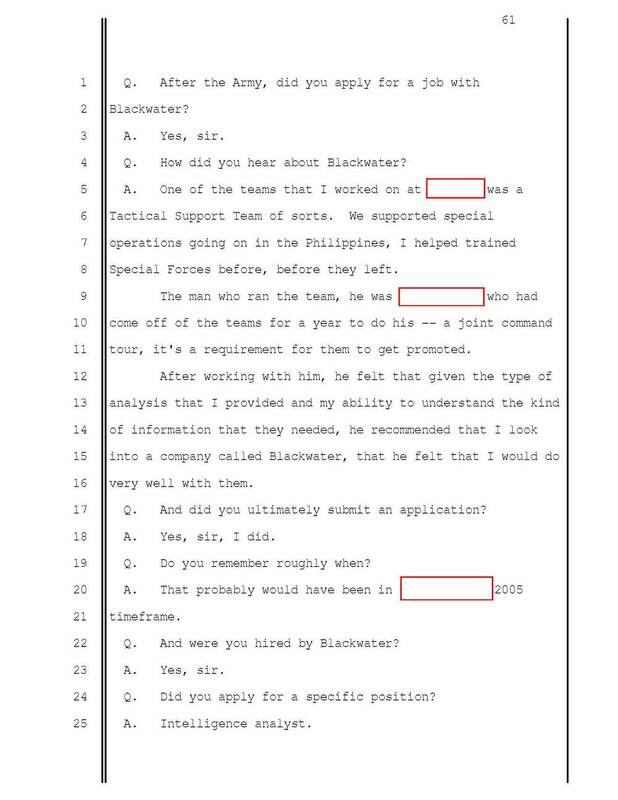 Bounty on the heads of Blackwater contractors. 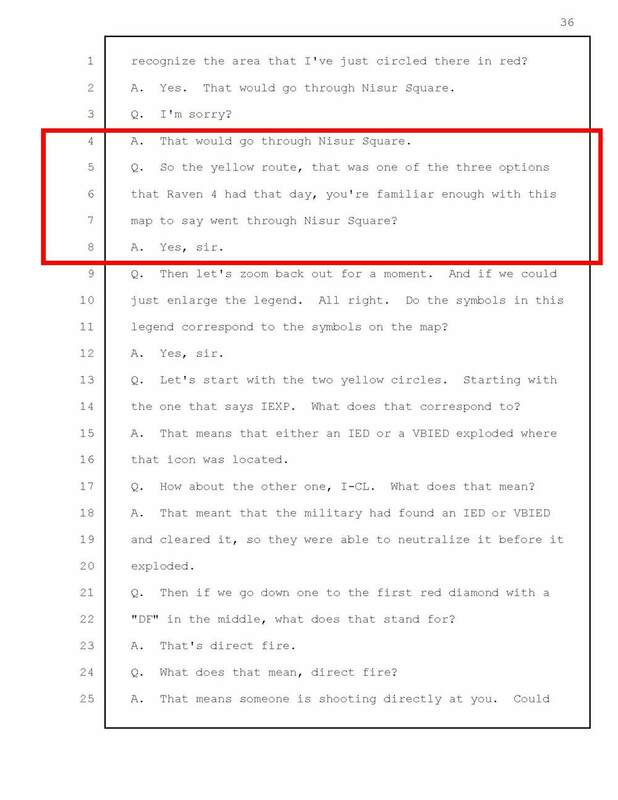 Blackwater - specifically. STAY TUNED - the cross examination will be posted next week. 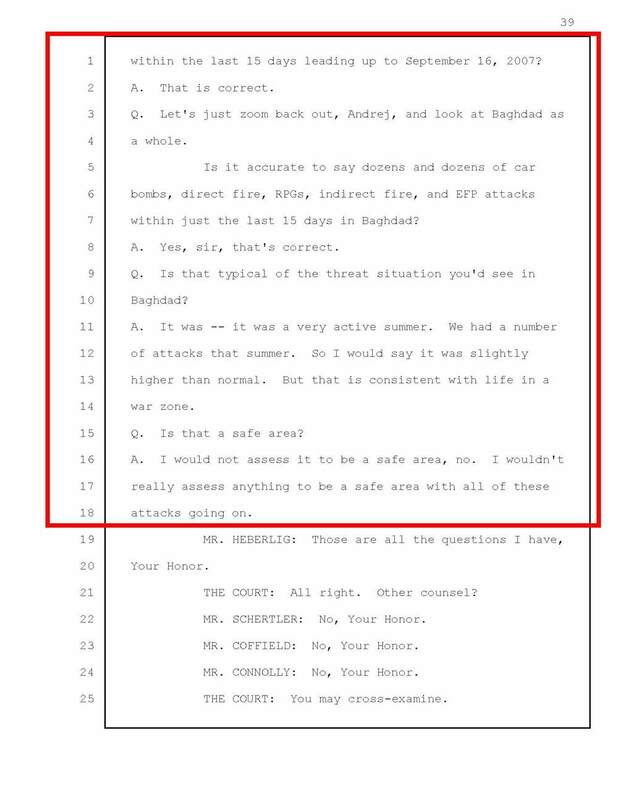 You will see how the prosecution did all they could to make light of the dangerous situation in Baghdad. Too bad they didn't have to work in the area, huh? If you've never seen what an IED going off looks like to someone in a convoy, see below. Our hearts especially go out to the families of the men manning these checkpoints. Any car, any time. May God bless their souls. April 8th 2007, Raven 22 rescuing a British Team protecting US Army Corp of Engineers. Video of the dramatic October 3 rescue of Polish Ambassador Edward Pietrzy show just how risky the maneuver was for the skilled Blackwater helicopter pilot. 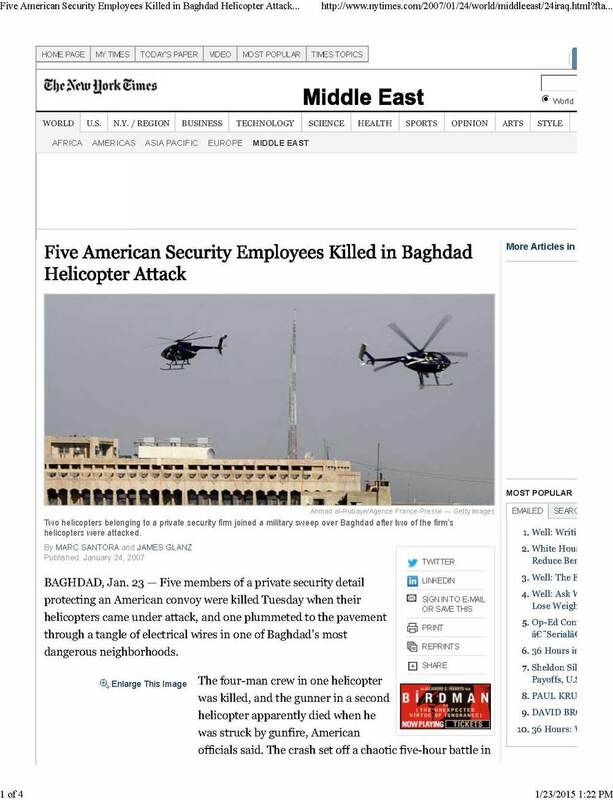 On January 23, 2007, 5 Blackwater contractors lost their lives when their helicopter was shot down, and during the recovery efforts. B Co 5-20, 3-2 SBCT ambushed as they pulled off recovering a downed Blackwater aircraft on 23 Jan 07. Firefight lasted over 45 min. Huge firefight! From the Blackwater Alumni - below is a list of their fallen. Rest in Peace, Warriors. Thank you for your service. 35. Jerome "Jerry" McCauley- KIA 31 January 2008; Baghdad, Route Irish. Brothers lost from other than hostile action over the years.